Yesterday in History – Mandela freed from prison | Random Musings of Bizzle! I was surfing through the net as usual and decide to check up a few facts on one of my respected role models, Mandela. I learnt that yesterday marked the day he was finally released from prison after 27 years of imprisonment. 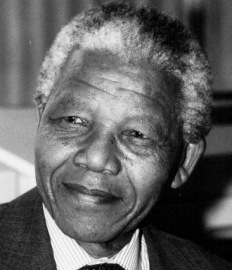 Nelson Rolihlahla Mandela, also known as Madiba in South Africa was the first black South African president in the post-apartheid era to be elected via democratic elections. Born in 1918, he was an avowed anti-apartheid activist and leader of the African National Congress. He was tried and imprisoned for his involvement in underground armed resistance activities. He was steadfastly committed to non-violence and the armed struggle was a last resort. He spent 18 years of his imprisonment on the now famous Robben Island where he was assigned the prison number, 46664. Upon his release from prison, he commenced a process of negotiation, national reconciliation and forgiveness. In 1994, the ANC won the overwhelming majority in the democratic elections and as the leader of the party was inaugurated as the president. He has achieved a lot in the field of international diplomacy and has gained international respect for his advocacy for social and human rights issues. Amongst the many awards and accolades received, worthy of note is the Nobel Peace Prize awarded in 1993.